Best Fishing Kayak for The Money - What's Our Verdict? A lot of people are having a hard time deciding which is the best fishing kayak for the money. This is because everyone has different expectations and budget when it comes to getting a fishing kayak which they will deem as value for money. Questions that often arise when buying a value fishing kayak are as follows. Are you looking for a fishing kayak for one or 2 person? Which type of fishing kayak are you looking for, sit in or sit on top? Maybe you are looking for a fishing kayak that can also surf? Could budget also be an issue? With all these questions, it really is hard coming to a buying decision because all kayaks have their own set of unique features and also their pros and cons. So who is our winner? For those who wants to jump straight to the bottom line, below are our top picks. Comes with 7 rod holders and free paddles. After spending a fair amount of our time trying out some of the kayaks ourselves, we now bring you a list of the top 6 kayaks that you will never regret buying. However, it is important to note that the positions are in no particular order of importance. Angler 130 has to be one of the best kayaks in under $1000 out there. It has all the stuff you need in a kayak, from spacious storage to rod holders. 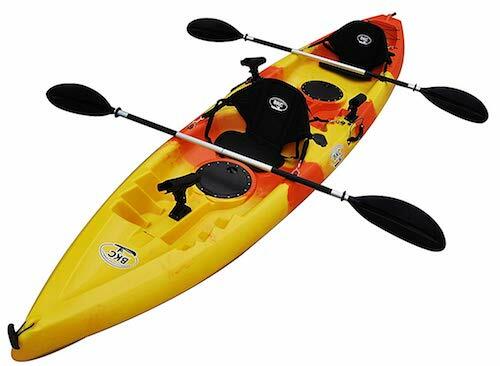 Plus, this kayak can be used for multiple purposes of fishing or just for recreational use. Let us talk about some of its features and specs along with some of the maintenance it will require, shall we? Length: It comes in a length of 13 feet, you can easily fit in it even if you are 6’4” tall or more. Width: It is as broad as 33”, ensuring that you have comfortable space to move in the cockpit. Weight capacity: It can carry around 550 pounds, so you can eat all the junk food you want. Paddlers: It is for people who like to enjoy the beautiful moments alone as it seats one person. Material: It is made of sturdy polythene material of high destiny. - It has 4 handles which are easy to grip so you can carry the kayak around. - It has a cup holder built in it. - It has a rubber system inside the cockpit which is controlled by your feet. - It has a seat that has dual position feature. - It has 2 tray holders. - It has extra mounting points as well so you can mount your gear on it. - It has 2 hatches as well which are sealed so the water cannot get in. - It also has a tank well in the rear end. - It has a near paddle park, so you can reach it with no difficulty. - It comes with 2 flush mounted fishing rod holders. - It has 2 bungee straps to hold the paddles on the side as well. - It also has mounting points along with lids to protect your things. - It has 10 drain holes in it which come plugs to clog when needed. - The skid plate included in this kayak is replaceable. Okay, there are certain things you would need to maintain you kayak’s quality. Here is a list of things for you to know about the caring of your most stable kayak. Sometimes due to the frequent contact with river or ocean water, your kayak might get covered with slime which could be problematic for the boat and for you as well. For this, what you can do is clean it with a mild soap and water. You can use a soft brush but do not use car wax on your recreational kayak, only Vinyl protectant products. You can remove minor dents from your kayak by warming it up in the sun for around 24 to 48 hours. If you get light and minor scratches on your kayak which bothers you, just hover a hair dryer on the scratch area and the material will melt enough to heal the scratch. However, it is suggested that you don't overheat it as it would damage your precious boat. All the customers dubbed Vibe Kayaks Sea Ghost 130 Angler as the best kayak for the money. They said it was reliable and durable. People also said that it was a great product and an ultimate fishing and recreational kayak. Running a little tight on that budget? Is the wife always complaining about you spending too much on your “toys”? Old Town Canoes has the best option for you. If your wife is also into kayaking, check out this article. 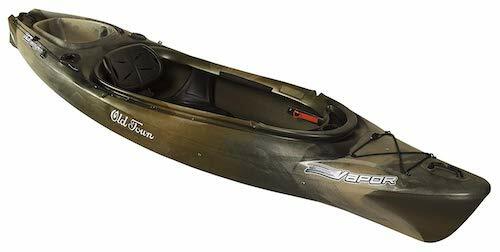 The Vapor 10 Angler is the best kayak for fishing under 500 dollars. It is available in some really eye catching yet concealing colors like the bright orange known as ”sunrise” and the hard to find camouflage called “Brown Camo”. Boasting of a very wide and comfortable cockpit and an ultra-light weight that can carry some serious pounds the Vapor 10 might just be your best choice. Let’s look at the details and what things will get your nails dirty for maintaining this kayak. Length: It is 120 inches long like its competitors it provides a comfortable fit. Width: It is 28.5 inches wide giving it that snug fit but still comfortable for most people. Weight: It is super light with a weight of just 49lb. Weight Capacity: The weight it can carry is considerably heavier than its own weight, 325lb to be exact. Paddlers: This one is for the lone wolf as well with the capacity for only one paddler. Material: It is made from a very durable material called Single Layer Polyethylene. - It uses an Adjustable Comfort Flex seat which can be customized to your needs. - The Glide track foot brace system ensures that you are always in control. - The spacious cockpit makes sure that you have plenty of space to move around. - The Vapor 10 is well equipped with space for your things to survive the waters for a day. - It has a molded in cockpit tray and a cup holder within your reach. - It can carry sleeping bags behind the adjustable seats. - The water proof compartments come in handy for storing keys and phones. - Built in carry handles are well positioned and comfortable to hold. 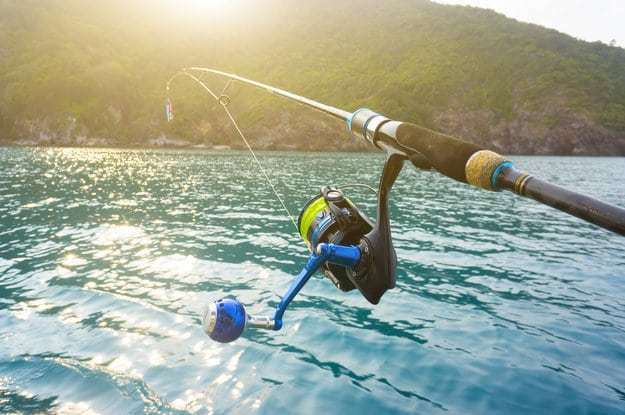 - It has a flush mounted rod holder for your fishing rod. ​- A sturdy skid plate. - It also has a molded in paddle rest to keep your paddle from interfering when you are just admiring the open waters. - The V10 comprising of single layer polyethylene ensures its sturdiness. - The design was made with two things being the utmost priority which are stability and efficient riding experience. - The drain hole is easily accessible and does a good job in keeping the cockpit as dry as possible. Mild soap and water cleanse can make the finish more durable and gives it a beautiful shine. The repairing process is simple and right at home for kayak users. Blow drying the kayak is important and the heat mends little cracks and tears. The draining hole as mentioned above should be used regularly to remain clean from any access water which may damage the cockpit. The overall review of the Old Town’s Vapor 10 was surprisingly good. Many people admitted to owning two of them and said that the hull was designed well with supreme stability. It had survived some light drops with no damage done to the overall body. The only complaint was that it had no skeg which caused to drift right or left while in a neutral position making it a little hard to maneuver. Considering it at its price range the Vapor 10 is an excellent choice if it suits your needs. We got a beauty here, guys. The best one for fishing and recreational purposes would be Vibe Kayaks Yellowfin 100 kayak. It is perfect for a long day ride on the water and very comfortable with the Hero seat. We assure you that this is the best fishing kayak under $750. Let us talk about the specs, features and maintenance of this kayak. Length: The length of this kayak is around 10 feet long, meaning even if you are considered a giant, you can fit in this easily and with full comfort. Width: It is as broad as 32 inches, super comfortable and spacious for you to sit in. Weight capacity: It can carry 375 pounds of weight, so eat away all the junk food you want, my friend. Weight: Its own weight is only 57 pounds in total. It would pretty easy for you to carry it or store it. Paddlers: It is a single person kayak, so you can enjoy the beauty of nature in solitude. Material: It is made of a strong material called high-density polythene. - It has adjustable foot braces. This way your entire family or friends can use it despite the height differences. - It has an in-built cup holder so you can take your tea or coffee with you on the water. - It has 4 carrying handles attached to for easy transport of the kayak. - It has a comfortable Hero seat, which is not padded but it is still very comfortable. - It has a tank well in the rear end. - It has 2 tackle trays as well, that are mounted on it. 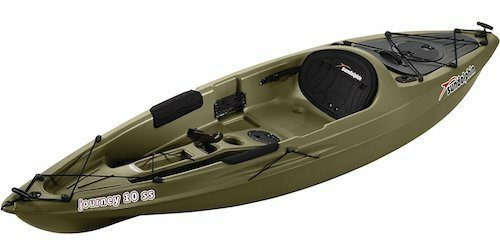 - 2 sealed hatches are also included in this recreational/fishing kayak so you can keep your gear safe form water. - It has 4 capped fishing rod holders near your sides so you can keep your fishing rods in the reach of your hand. - It is made of single piece of polythene material. - 6 drain holes to ensure that your boat remains as free from slime as it can, they also have plugs to clog them when not needed. You should clean your kayak with a mild soap in order to not to damage its body. Along with the soap, you should use a soft brush. To give it the shine, we suggest you use a Vinyl protecting product and not any car wax. To remove minor dents, you should just leave your kayak under the sun for 24 to 48 hours and the dents will go away automatically. You have got to drain all the water from your kayak and let your boat breathe and ventilate. This will help you to keep it fresh for a longer period of time. To fix minor scratches off of your recreational kayak, you should hover a hair dryer over the scratch to melt the top layer of the kayak to fix it. Be careful, do not over heat it. 95% of the people said that it was a great kayak and that the service was also remarkable. Only 5% people had issues with the kayak and said it was highly unsatisfactory. 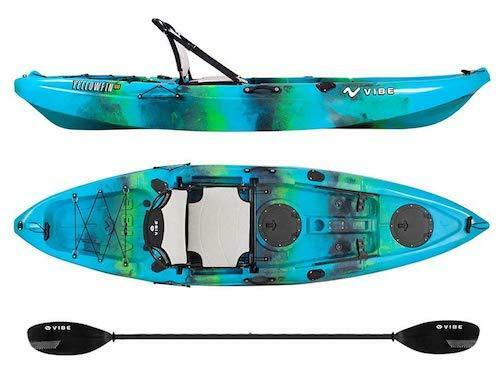 All in all, Vibe Kayaks Yellowfin 100 Angler has gotten a large number of good reviews from happy customers so this means it is reliable, durable and a must buy. If big rivers and the open sea shores is not your thing then Sun Dolphin has got you covered with their 10 foot long Journey fishing Kayak. Great for small lakes, rivers and even canals the Journey Kayak can take you to all those hard to reach fishing areas where other kayak’s would not dare to go. What is commendable about this product is its very affordable price tag and time to time sales makes it one of the best fishing kayak under 400 dollars. There are two color options available namely “Olive” and “Sand”. Both the colors look good and come down to personal choice. Length: Keeping up with its competitors the length of the Journey Kayak is 120 inches. Width: Journey Kayak is 30 inches wide keeping in mind the bulkier fellows fit in it easily. Weight: The assembled weight of the Journey is 44lb making it one of the lightest kayaks available in the market. Weight capacity: The Journey SS can carry up to 250lb of weight which even after you is a lot to keep your essentials handy. Paddlers: This kayak seats only one fishing and kayaking expert. Material: It is made of UV-stabilized Fortiflex High Density Polyethylene which is the material of choice for a lot of kayaking enthusiasts. - It has a sit on top design with a comfortable seat and plenty of room in the cockpit. - The protective thigh pads ensure safety even in the roughest of conditions while providing comfort to your legs. - The inside padding is a feature that can be fitted in for some extra expenditures. - The sit on top fishing kayak design provides more place for cargo in the back. - Shock cord deck rigging is also in place. - It has two flush mount and one swivel rod holders. - The molded handles on the hull make it easier to carry and place in vehicles. - The carrying handles are also retractable for a little more storage. - P.A.C (Portable Accessory Carrier) can be used as extra storage. - Journey SS is made from Rugged UV-stabilized Fortiflex High Density Polyethylene which ensures a sturdy built that will last a long period of time. - ​Its shape allows it to be paddled easily and while maintain maximum stability over the water conditions. The kayak can be cleaned by a wet cloth because of its finish. Little soap may cause some extra shine. The Kayak is pretty sturdy hence the finish and the paint are designed to be highly durable. There is no mention of a drainage hole but if there is not one present the kayak still needs to remain dry. The best way is to turn it upside down and blow dry it thoroughly. The repairing procedure is the same and you will feel entirely at home while repairing this kayak. Heat if your best friend for small cracks and tears but be careful to not over heat it and melt a hole in your kayak. 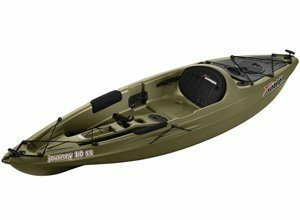 The Journey kayak scored around 3.5/5 stars on an average in various customer fishing kayak reviews. The kayak has been known to be in control of the paddler while kayaking against the currents and has an impressive speed record. The removable storage and the rod holders were a delight to the customers. The problems faced by the users were while fishing the kayak remains still and is not balanced enough to support a paddler standing. To conclude the Journey kayak may need to have some improvements but at its price range offers some very delightful features. 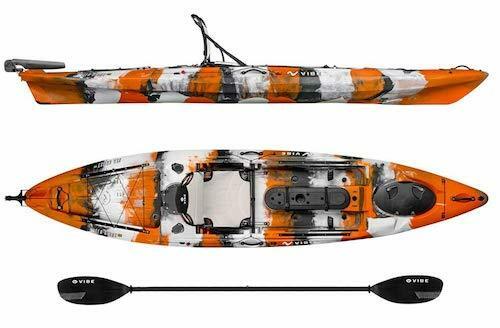 This fishing kayak by Lifetime has to be the best kayak under $700. This kayak is a 10 feet long beauty which looks great on the water and easy plus comfortable to sit in. The most important part to know about any product is to know about the features and specs along with how to take care of it. Length: It is 120 inches long, meaning it will accommodate you even if you are considered a giant. Width: It is broad enough for you to sit in it comfortable with the width of 36 inches. Weight: It is light to carry as it is only a 60lb in weight. Weight capacity: This fishing kayak can hold up to 500lb of weight, which would not be trouble for many people. Paddlers: It can accommodate 2 people; you can enjoy it with you friends and family. Material: It is made of a very durable material called roto-molded polyethylene. - It has multiple modes for foot rests so people of all sizes can use it. - It has comfortable seating with soft padded seat. - The seat keeps paddlers above the ground of the kayak, making it more comfortable. - It has a storage hatch at the rear end of the kayak. It is well spacious and will hold your gear securely. - It has shock cords that will allow you to carry gear that cannot fit in the hatch. - It also has fishing rod holders mounted on it, so you can keep them in your arm's reach. - It has paddle clips on the front and back of the kayak to hold your paddles in place when you are not rowing. - The design of the hull is done in such a way that the kayak remains stable on the water. - The length of the kayak is not too much so it is easy to transport, carry and store. - It has carrying handle on the front of it. - The structure of the kayak allows you to choose if you want to ride it solo or with a partner. - It has drain holes in the cockpit so the water getting inside could be drained frequently. You can clean your kayak with a mild soap and water, so the polish does not get messed up. You have to drain your kayak through the drain holes installed so it does not get slime from the water. Just like all kayaks, you need to blow dry your kayak. This means that you will have to blow dry the scratched area so the material can melt a little and heal itself. This one is not for the faint-hearted or the one who cannot handle what we are about to throw at them. This one is for the pros and the veterans of kayak fishing. If this kayak does not give you an edge over the competition, I do not know what will. 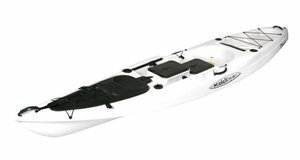 The Malibu X-Factor is packed with features which are essential for your expeditions be it rivers, lakes or the mighty ocean. The high price tag justifies itself by all the cutting edge features this kayak has. The X-factor comes in a variety of colors and even patterns. You have a wide variety of colors to choose from that can enhance your personality even more. It has been handsomely named as “The pickup truck” of all kayaks. It is available for over a thousand dollars depending on where you buy it from and what features you get. Let us dive deep into the features list before we get carried away drooling over this fine product. Length: The X-factor is 14 feet and 4 inches long making it ideal and very stable for large water bodies like the ocean and large rivers. It won’t be suitable for canals. Width: Its 33 inch width ensures that even the bulky fellows can fit in incredibly easily and enjoy the sport. This also ensures a comfortable fit for tall people and ads to the stability of the product. Weight: The weight of the X-factor after assembling is 64lb which gives it a lot more center of gravity for a smoother ride experience over some very troubles and raging waters. Weight Capacity: The X-factor can hold up to 550lb of cargo and supplies that will last you for days in the waters. It even has a capacity to carry 3.75 gallons of tank capacity in the models that support a trawling motor. Material: As of now the name of the material being used to make the X-Factor is not known but who cares? This beast is extremely durable and is even backed up by a limited lifetime warranty by Malibu kayaks. Paddlers: There is an option for either one or two paddlers. The price of both the kayaks is nearly the same but the one with two paddlers sacrifices over a few features. - The X-factor boasts of a super comfortable X-Seat which is highly adjustable and can turn 180 degrees for optimal height. - The front and back consists of two child seats which can be used as a dive tanks. - The cockpit area is wide and allows a good viewing angle while giving ample amount of space for the rider to move and paddle the kayak. - The X-seat is also self-drying. - The ​X-factor has a variety of storage spaces which can carry 550 lbs of cargo. - ​Front and back dive tanks to make for an optimal diving experience. - ​The hull is super wide for a very stable ride even on the roughest of ocean waters. - It has a gator hatch to store products. - A center hatch is present underneath the rider for sleeping bags and other camping equipment. - 6 flush mounted fishing rod holders so you can bring all your fishing rods for all types of situations. - Cup holders which are easily reachable so you are never deprived of your favorite beverages. - It even has the carrying handles on the side that make it easy to carry and move around considering its size and weight. - The drain is also strategically located to ensure a dry cockpit. - Self-cleaning trays are also a feature to look forward to while buying this kayak. - It even supports a trolling motor to make your fishing ​experience worth the while. - The material used on the X-Factor is still not disclosed by the company or available anywhere online. - The shape of the X-Factor has been strategically designed to give the most stable experience and a smooth ride. - The hull and the weight both increase the center of gravity which gives it a better chance of not toppling. - The wide storage spaces give you space for supplies that will last days. - The material used is super durable. Malibu Kayaks are so confident over their product that they give a limited lifetime warranty with it. The soap, water and a wet cloth combination would do just fine for cleaning the X-factor. The paint is ensured to be as durable as possible and the finish can be waxed for an even better look. The drain is placed in a location that dries out the cockpit fairly easily. Furthermore the seat and the trays are self-drying which eases up our man power. An overall blow dry would be even better. Just like its nickname suggests, The “Pick-up truck” does not require a lot of maintenance. It is super rugged and can withstand the test of time and strength. Since we do care about our thousand dollars the repairing of small tears and scratches require a little heat and your kayak is as good as new. With a whopping 4.5/5 star average review, the Vibe Kayaks’ Sea Ghost 130 Angler is undoubtedly the best fishing kayak for the money. The customers thoroughly enjoy the experience which is provided by the kayak. It has a very surprising dry ride even in the unpredictable ocean waters. The options available for buying this kayak give the customer a sense of more customisability. The ride is super smooth and the balance is phenomenal. The vibe sea ghost remains sturdy and in place even if you are using diving boards, giving it the title "best stand up fishing kayaks". This is a very informative post! This is a must read for anyone new to the sport of best fishing kayak. Thank you for writing this. Hi Rahman, Thanks for your kind word and am happy that you enjoyed my content.